This story starts with an online threat by someone with a gun. Because it was taken seriously by the people threatened, the consequences to the perpetrator extended beyond a single act. It’s a companion to my case study, What To Do If A Trump Supporter Threatens You. I was going to call it, “What To Do If a Gun McNutt Threatens You.” but that would look too much like a joke. This story is no joke. In March gun-rights activist Chris McNutt posted rants on Facebook about lack of movement on a Texas bill allowing gun owners to legally carry handguns without obtaining a state-issued license. McNutt, executive director of Texas Gun Rights, then drove to Texas House Speaker Dennis Bonnen’s home about 50 miles south of Houston while Bonnen was in Austin and his wife and teenage sons were home. McNutt also visited the homes of Reps. Dustin Burrows of Lubbock and Four Price of Amarillo. After McNutt posted his North Texas visits to social media, the Bonnen family got word the Department of Public Safety felt it would be appropriate to watch the Bonnens’ Lake Jackson home, said Kim Bonnen, the speaker’s wife. “It’s very rattling as a parent to be sitting 240 miles away and get a text that DPS thinks it’s appropriate to put troopers at your house,” she said. The Bonnens’ 14-year-old son was the only family member home when McNutt paid a visit Wednesday, Kim Bonnen said. There was no contact between McNutt and the child, she said. “He chose to pull a tactic of intimidation and threat toward our families,” Dennis Bonnen said. McNutt could find the speaker and the other representatives at the Capitol to give them whatever information he wanted to share, Dennis Bonnen said. The choice to visit homes where only wives and children are home shows instability and lack of character, Bonnen said. “To create the impression that he’s willing to threaten my family is unacceptable,” Bonnen said. 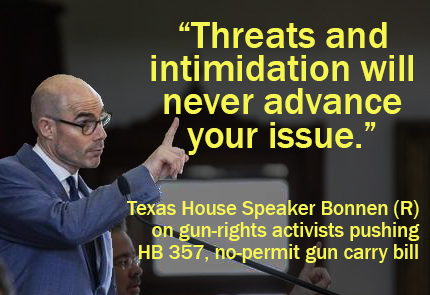 Bonnen, a Republican who was elected Texas House speaker in January, said Friday that the activist’s “gutless intimidation tactics” exposed no-license carry as a bad idea, dooming the legislation. 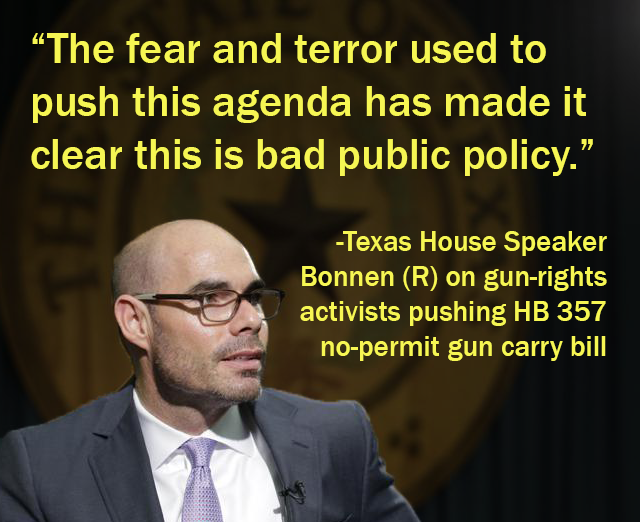 Representative Bonnen experienced the fear, terror and underlying threat of violence from gun-rights activists that are regularly used against their critics. The fear of violence is often dismissed by pro-gun activists and their supporters. They mock people who are concerned about armed men who show up at houses of gun-control activists and protests. “It’s legal!” They will say. Gun-rights activists state proudly they go everywhere armed, then pretend that the implied threat of violence is an overreaction. We can’t see what rants McNutt or his group posted on the Facebook pages of legislators, or what emails were sent to them directly. We don’t know what the Bonnen office staff heard in phone calls from Texas Gun Rights members. However, we do know that there was enough evidence for the DSP to have officers stationed at Bonnen’s house. We also know what the Texas Gun Rights group has posted publicly. I’ve included some images from their Facebook page. Images from Texas Gun Rights Facebook page. The call to go armed everywhere everyday from Texas Gun Rights Facebook page. Legislators could understand intellectually that making guns legally available almost everywhere would have an impact on political speech, but it wasn’t until a pro-gun legislator saw how this tactic of intimidation and threat toward his family, did he finally get it. Even the author of the legislation, Rep. Jonathan Stickland, R-Bedford, condemned the action and said Friday he was canceling his request for a committee hearing on House Bill 357. The author of the legislation, Rep. Jonathan Stickland, R-Bedford, said Friday he was canceling his request for a committee hearing on House Bill 357. “The issue is of great importance to me, but I refuse to act like it is still a possibility and continue to provide false hope to my constituents,” Stickland said in a written statement. The message that this behavior was unacceptable made it to Fox News, reaching an audience that might have ignored a statement condemning this if it came from a Democrat. “I could no longer watch as legislators and their families are incessantly harassed by fanatical gun-rights activists who think laws preventing criminals from carrying a gun should be repealed,” Bonnen said in a written statement. If Fox News viewers now see how the pro-gun activists intimidated pro-gun legislators, what kind of harassment and threats have legislators who are not pro-gun experienced? 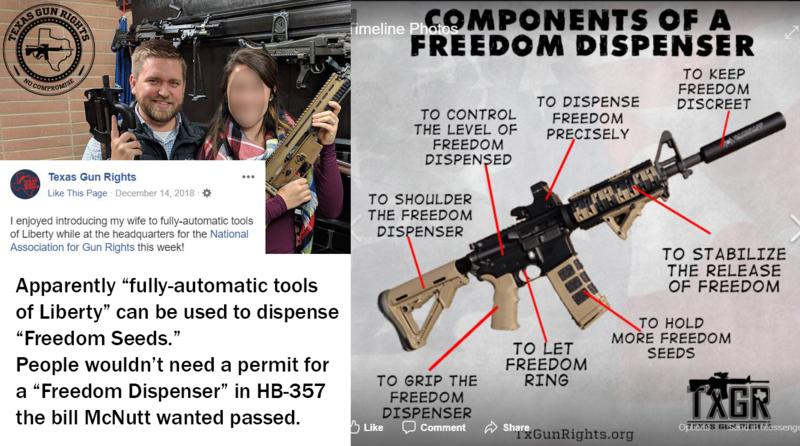 I went to the Texas Gun Rights Facebook page and pulled some images Before being accused of cherry picking and sensationalism for this order, this was how they were in on Facebook on April 11th–a gun pointing at Rep Kyle Kacal’s head. I have complete screen shots if they are taken down. Remember how you felt when McNutt threatened your family? Not everyone can have police protection at their home, but you could make it possible to remove the guns from people who make threats to you or your family. HB 131 gives others who are threatened a tool for swift protection of themselves or their family. Extreme Risk Protective Orders and Red Flag laws save lives. Vote yes on HB 131. Showing legislators how lax gun laws have personally put themselves and their families in danger, and then giving them a bill to pass to protect their families and constituents, is a good method to get change. McNutt response to these stories was to call it a “media hit piece.” I watched his response video. I listened to him on the Todd and Don Show. Where he stated that “Texas Gun Rights does not support any threats of violence, never has, never will.” Great, nice to hear. But what McNutt failed to do was address his actions in the context of what he and his group say on their site and Facebook page. McNutt posted images of himself going to legislator’s homes. This time pro-gun legislators stopped ignoring the implied threat of people who may be armed with more than flyers. McNutt broke the unspoken agreement with pro-gun legislators. He also broke a man code, because he went to homes when the legislators were gone and only women and children would be there. The pro-gun legislators can’t say, “People should never carry guns at protests and when canvassing,” since that would go against what they voted for. So instead they focus on how it wouldn’t be a fair fight, since the armed man of the house isn’t there to scare away the other armed man, shoot first if they feel threatened or shoot back after the other armed man missed. So what is the answer to the fear of legally armed people coming to your door trying to convince you of their ideas? Increase restrictions on who can carry guns and where. But for the pro-gun legislators to do that would be to admit the frightening world they have created. Their answer is armed guards for the people in the home, armed spouses and children. That are other answers than OFFENSIVE weapons to deal with a treats. 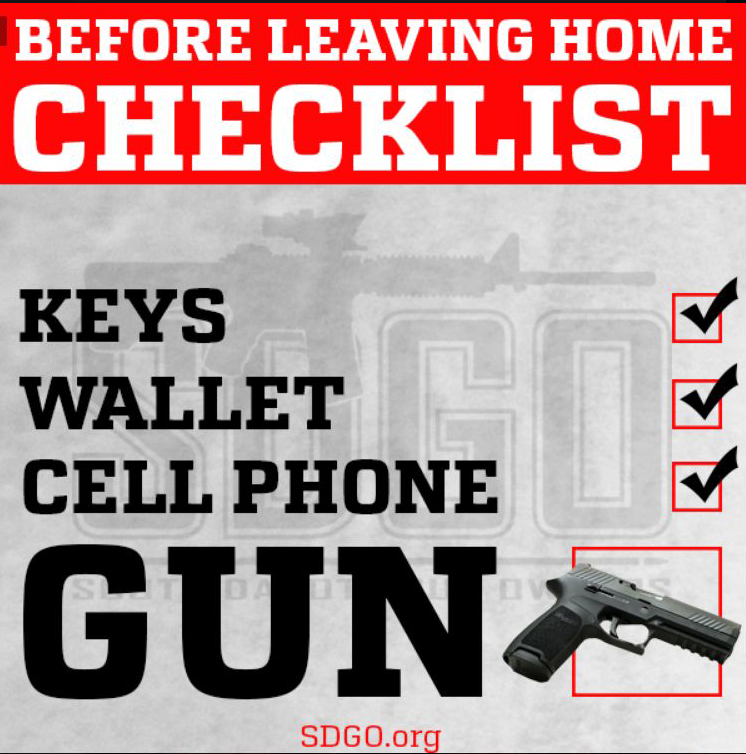 Especially considering of the additional danger of guns in the home. 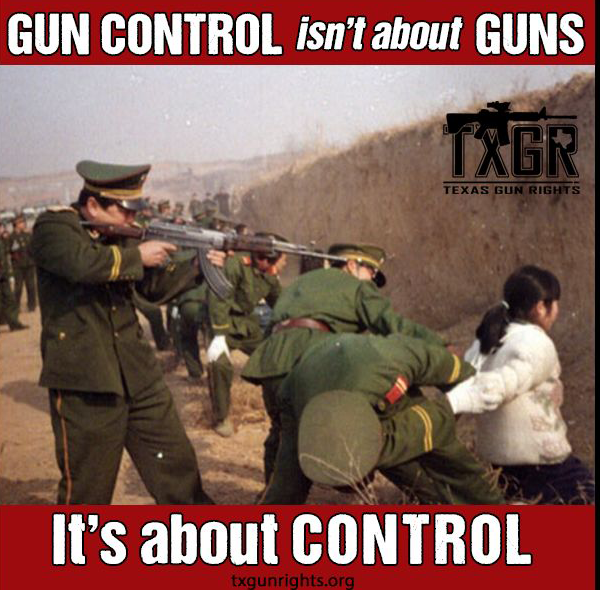 From Texas Gun Rights page, images that show their views that guns are used to scare “bad people” and that guns should be carried instead of kept in a safe. McNutt actions blew open the charade. He did the gun control movement a huge favor. By giving pro-gun legislators an opportunity to push back on the extremist gun owners, they can walk away from extremist behavior. Was it planned? Perhaps, from The Texas Tribune “It was a setup”: House Speaker Dennis Bonnen, gun rights activist come face-to-face at Texas GOP fundraiser Maybe. Will the legislators who killed the bill be punished for it from their base? Hard to say. I read a lot of comments where pro-gun people said it was a stupid move and blame McNutt for killing “constitutional carry for years.” So they might maintain their base, who also dislike extremists. This McNutt event can also be used to remind pro-gun legislators of what to do the next time and armed pro-gun extremists show up protests. Like this guy at a Beto rally. “Normally in a protest, you’re going to have two opposing sides at least,” he said, noting that tensions can result in violence. Bringing guns into that situation, Dyer said, is “very distracting” for officers. “Even open carry proponents will see the common sense in restricting open carry in environments like a protest,” he said. Now that pro-gun legislators were threatened they know how others feel. They can choose a different action going forward. While it might look like they are going against their base, they are really pushing back against a small extremist group whose actions are condemned by the majority of gun owners. People often give up hope on Texas having sensible gun laws, but I don’t. This recent response shows that there are rational legislators who aren’t led by fanatical gun-rights activists.